I was trying to clean the big glass front of my oven door as well. I tried so many things that day. I wet washcloths with vinegar and laid them on the glass to soak. I made a paste with baking soda and laid them on the glass and then scrubbed with it. I let the baking soda and vinegar bubble together. I tried regular dish soap and let that soak. I tried using a lemon, scrubbing with both the inside of the lemon and the outside rind of the lemon. My darn lemon even fell apart I scrubbed so hard. I even tried scrubbing with coffee grounds. Again. . . .. I'm not kidding. I have no idea why I did that. But, nothing else was working and coffee grounds can be slightly abrasive without actually scratching (I hoped). Some of the grease was coming off. It was evident by the lovely color of brown that all of my washcloths were turning. And no, it wasn't brown from the coffee grounds. That was an observation I made before I even tried the coffee grounds! I could tell that I was making some headway, but there were some stubborn grease spots that just weren't budging. At one point, I figured maybe that oven door might just give me a break because it was beginning to feel sorry for me. I'm serious. I thought that surely I had worked hard enough that maybe that thing would become clean just because I had put so much time into it. I scrubbed so hard my hands, wrists and arms were sore that night. I don't know why it's called "elbow grease" when everything BUT my elbows hurt. Because the kids were coming home and I had to start dinner and just because I was exhausted, I had to quit that day. I opened that oven door back up this morning and started trying again. Then, I had a thought. What if I try to scrub it with a dishwasher tab? I'm sure there are still chemicals in there that I don't want to use, but at this point, I'll try anything. And it can't be worse than actual oven cleaner. Can it? I don't know. But after all my work, all I wanted was spotless glass on the front of my oven. So, I put my rubber gloves back on and started scrubbing with that dishwasher tab. . . .
a miraculous thing started to happen. . . .
those darn grease spots started to come off. I made sure to rinse with clean water several times to make sure any residue was removed. I finally have clean glass! And guess how much it cost me? I bought these dish tabs when the boxes were Buy One Get One Free at Riteaid, so I got 64 tabs for around $8.00 or 12 1/2 cents each. It cost me less than 12 1/2 cents to finally get this thing clean (well, I mean after all the vinegar, baking soda and lemon peels from before--but now I know better for next time). And you know what? I rinsed the grease off that tab and used it in my next load of dishes. It was almost still whole. It only took a little bit of the dish tab to clean the window. oh my god. I need a dishwasher tab! THANKYOU! You're welcome! Happy to share after everything else I went through to try to clean that thing! 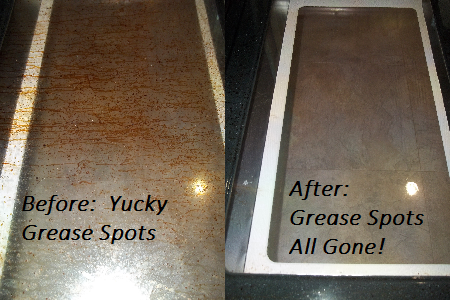 I don't think my oven door has ever been that clean! Good to know, thank you! You're welcome, Elizabeth. Have a great weekend! Thank you for hosting Good Morning Mondays! Hope if you tried it, it worked for you! LOL I could feel your desperation to get it clean when you grabbed the coffee! So glad you found something that worked. Thanks you so much for sharing on the (mis)Adventures Mondays Blog Hop. I look forward to seeing what you share this week! LOL! I know, right? Thanks for hosting the (mis)Adventures Mondays Blog Hop! I always scrub my oven until it gets clean and it takes a lot of time and is pretty annoying. Thanks for sharing your tips I appreciate any help I can get. You're awesome and I will share your post with my friends. Thank you for the share. Hope you have a great week!